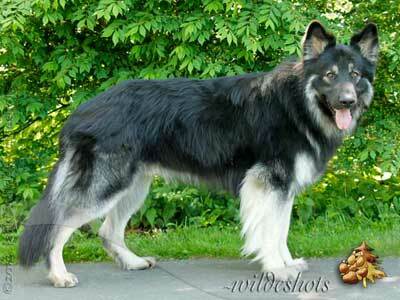 Atlantis Shiloh Shepherds and High Caliber Shilohs are thrilled to announce the upcoming breeding of Arena to Colby. Arena (Zeus/Abbey 2009) has a wealth of attributes to contribute to the breed including a wide muzzle and head, very substantial bone and chest, a great topline, correct tail, beautiful movement and rich pigment. 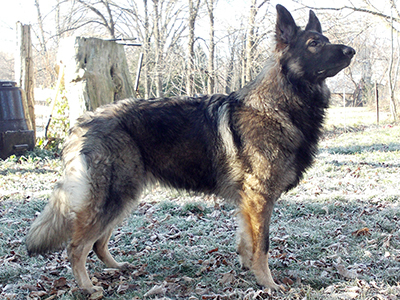 Arena had a number of accomplishments throughout her show career and was ABIDS Top Puppy of 2010 as well as a National Select with both NSBR and ISSDC in 2011. She is a super sweet girl who loves everyone she meets and is always eager to please which leads her to excel at obedience and tracking. Arena has a great amount of focus and drive when needed but loves equally as much to curl up on the couch and cuddle. Colby (Aquilo/Terra 2010) is a very impressive plush boy with a fantastic blocky head and muzzle, fabulous ears, great height, a correct tail, and a wonderful temperament. He has also done extremely well in the show ring earning a Grand Victor award as well as being a two time National Select. We expect this pairing to produce outstanding, substantial pups with blocky heads, great bone and chests and sweet, stable temperaments that will excel at a variety of activities and make wonderful companions. We expect plush puppies with the possibility of sables and duals in a variety of grey, red and brown.